THE RISE fly reel, Redington’s latest offering, fits firmly in the beginner-to-intermediate category. The reel comes in four sizes (3/4, 5/6, 7/8, 9/10) and three different colors. It retails at an attractive $149 – $179. According to Redington: “We’ve taken our super dependable CD Series reel and made it lighter and more attractive. This fully machined 6061 T6 aluminum mid-arbor construction reel features a cork on Teflon center drag design and a Koyo one-way clutch.” Koyo maintains that the drag system is free from “creep,” diminishes heat generation, and has excellent grease retention. Ceramic coated bearings aid smoothness and durability. At this price point, it’s reasonable to expect some give and take. The Koyo clutch delivers remarkably smooth and consistent pressure at every single setting. One of the hallmarks of any outstanding piece of fishing gear is that it can be fished with confidence, and the RISE will allow you to do just that. The Give: Superb performance. The Koyo clutch delivers remarkably smooth and consistent pressure at every single setting. One of the hallmarks of any outstanding piece of fishing gear is that it can be fished with confidence, and the RISE will allow you to do just that. Ergonomics and fit are also remarkable for a reel in this price category. The spool-to-frame fit is perfect, with zero lateral play, resulting in a reel that’s a pleasure to operate. The drag knob is one that all manufacturers should take note of. There’s no question that reels are sporting sleeker profiles these days, with drag knobs looking like they’re practically integrated into the frame itself. Pretty? Perhaps, but it’s not very practical. No searching or fumbling for the drag knob on the RISE: it’s large, adequately textured, full-center, turns smooth, protrudes at 90 degrees from the frame for a full 7 to 8mm — and it doesn’t look bad, either. Drag knob perfection. Now for the Take: dry and unspooled, the 5/6 model weighs in at a whopping 4.78 ounces. Many similar sized models at the high end of the fly reel retail range come in at a respectable 3 to 3 1/2 ounces. Despite the huge materials and composite advancements that have taken place over the last five to seven years, there are still many manufacturers that resist using these readily available materials in all but their top-tier gear. Granted, you shouldn’t expect a 3.25-ounce masterpiece of design and engineering for under $200. But a near-5-ounce model for a 5/6 line is noticeable when balanced with most rods in that category — especially as fly rods get ever lighter. As most are beginning to observe, many reel manufacturers seem to be having a hard time keeping pace with rod design by reducing weight at the reel end. Designers and manufacturers take note: reels to be balanced with fly rods — not hockey sticks. The RISE also has some design flaws that hint at potential trouble spots, most notably the spool’s exposed clip wires and the almost fully exposed Koyo clutch. Considering that the reel was designed for both fresh and saltwater use, you’d expect that delicate mechanisms have at least some cover from dirt, salt and other abrasives. Be particularly attentive to how and where this reel is placed and rinse very well or expect a prompt encounter with every reel’s foe: corrosion. Finally, a complaint I’d like to register with reel marketers in general: more effort needs to be placed in the description of reel “cosmetics.” In this reel’s case, “burnt orange” turned out to be pink/orange. (I may not be a designer, but I do know that there shouldn’t be pink overtones in burnt orange.) I encountered the same problem last month when another manufacturer listed a color as ‘slate gray;’ that reel had pink and purple overtones. Overall, the Redington RISE is a very good value if you tend to keep your gear free of debris, and if the potential for it being slightly out-of-balance with the standard fly rod is not a huge concern. 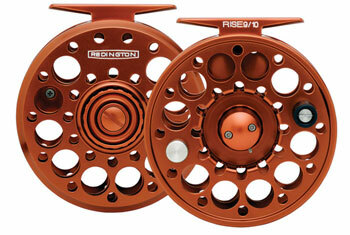 More information on Redington RISE fly reels can be found on the Redington Web site.